Home > Intel Security > Have you Performed a Health Check on your Organization’s Ability to Deal with Cyber-Attacks? Intel Security commissioned Evalueserve to do just that with a cross-section of organizations around the world. The results from this insightful survey have been compiled in the recently released report, which also identified eight key indicators of attack. 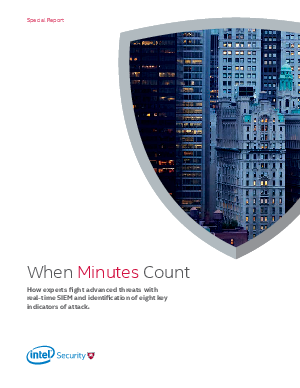 Download “When Minutes Count” and gain valuable information on how experts fight advanced threats with real-time SIEM.